The Flotilla 26 search-and-rescue team of David Troutman of Rome, Robert Newton of Blossvale, Ralph Moore of Sauquoit and Mitch Ford of Utica received the Coast Guard Meritorious Team Commendation "for exceptionally meritorious service" from July 5 to July 6, 2012, while searching for survivors of a fatal recreational boating accident on Oneida Lake. Troutman receives team commendation from Cmdr. N. Podoll. 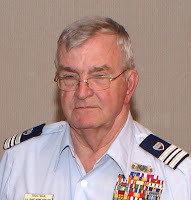 "Flotilla base communications center quickly notified the auxiliary boat crew," the citation said, and coordinated "the flow of information to all concerned assets which included: Oneida County Sheriff's department, New York State Police and the local fire department as well as Coast Guard Station Oswego." The crew got underway quickly and "went on to conduct multiple ordered search patterns during the late night search. The team worked directly with Coast Guard Sector Buffalo and the onsite Coast Guard helo to search areas of concern throughout the night and well into the morning. The team tirelessly searched for the missing persons until the search became a recovery operation." The commendation was presented by Coast Guard Cmdr. Nathan Podoll, director of the 9th District Auxiliary, assisted by Commodore Nancy Rudiger and Coast Guard Chief Warrant Officer 2 Kevin Kleisath, operations training officer.. In addition, Troutman received the Auxiliary Commandant's Letter of Commendation for his work as flotilla communications services officer, vessel examiner, and AUXCHEF (auxiliary chef supporting Station Oswego). 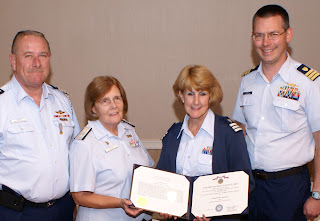 Also, flotilla member Helen "Lou" Cummings of Utica was awarded the Coast Guard Auxiliary Achievement Medal for "superior performance of duty" while serving as Division 2 commander for the past year. 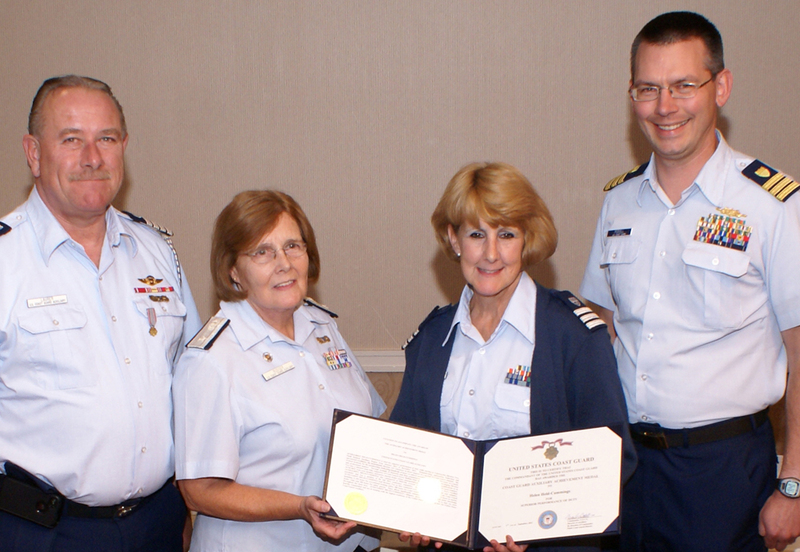 "She meticulously directed 124 volunteers in direct support of a myriad of Coast Guard missions," the citation said. "…She led Division 2 as they conducted over 14,997 hours of support for the Coast Guard, including 11,492 hours for recreational boating safety, 588 hours for Coast Guard operational support, 735 hours in marine dealer visits and 450 hours for safety patrols." 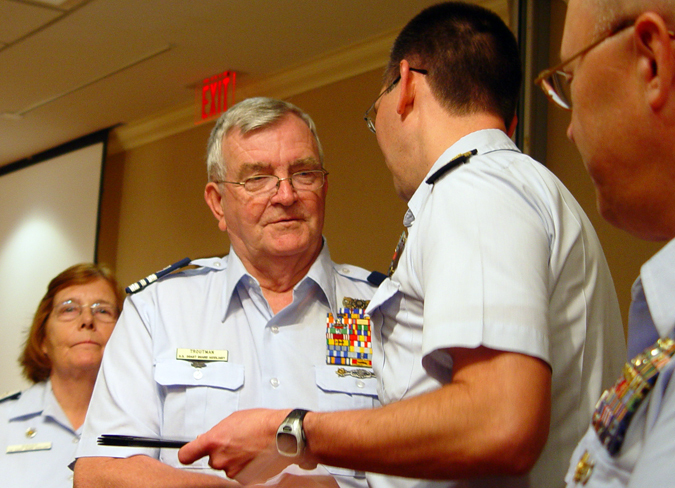 Presenting the award were Commodores Robert Laurer and Nancy Rudiger, and Coast Guard Cmdr. Nathan Podoll. Laurer takes over as commodore after serving as Rudiger's chief-of-staff. Joining Laurer on the leadership team are: District Chief of Staff Edward Monaco of Cuyahoga Falls, OH, and District Captains Michael McGrath of Newfane, NY, Anthony Ruque of Mentor, OH, and Robert Scofield of Hammond, NY. The 9th District Eastern Region stretches across Ohio, Pennsylvania and New York, from Toledo, Ohio to the St. Lawrence Seaway.